The latest update means that the news and sport areas of bbc.co.uk have been brought into line with the new Web 2.0 version of the homepage launched in February. The BBC calculates that 95% of web users have screen resolutions of 1024 or wider, so the site now makes more use of space, with the whole site being wider than before, while the text is now centred. In addition to these changes, the images on the site are bigger, while more prominence has been given to audio and video content alongside news stories. It’s not the boldest of redesigns, but it is easier to use when compared with the previous version, and the site looks better with a more consistent look. However, the redesign has adversely affected the navigation, in my opinion. The last version of the site had links to other sections of bbc.co.uk, such as TV, radio and an A to Z index on the masthead. Now the top of the screen continues little except for the BBC logo and a search box. This space would have been better employed displaying links to the other sections of the website. The double header is slightly odd too, and takes up a lot of space without contributing much to the look or the functionality of the site. 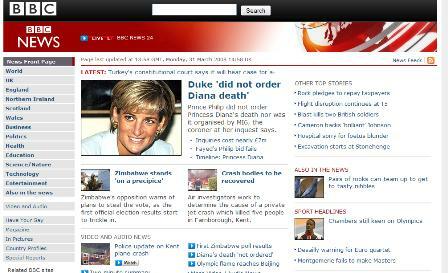 Reaction has been mixed on the BBC’s internet blog. Some have praised the new, cleaner look, while others are not happy that a site they have become so udes to has changed its layout. Whether you are a new entrant to e-tail or an old hand with large sales volumes, the right content optimisation strategy is vital in order to effectively leverage multivariate testing tools within your organisation. How can you help promote RSS Awareness Day? The number of people using the web is increasing every day, but the adoption rate of RSS as a technology is still way down at 5%. Leon Bailey and Jonathan Hirshler look at how five of the UK’s most popular campaign groups can enhance their online visibility and presence.